Researchers in this field aim to understand the brain mechanisms supporting cognitive and social behavior in humans, and how these mechanisms may be altered in various disease models. As this often requires bringing together a data of different types, one software to work as an integration platform is ideal. The Observer XT is that platform. The Observer XT is a professional research software often used in human neuroscience research. It allows for easy integration of multi-modal data, such as fMRI data, or other physiological measurements such as EEG or EMG, along with manually coded behaviors of interest. For example, synchronizing EEG data with video recordings allows the behaviors of interest to be linked to EEG data points. The Observer XT is the ideal integration platform. Eye tracking data can also be integrated into The Observer XT. Eye trackers are particularly useful for investigating brain damage, neurological diseases, and general visual and neurological functions. Combining multiple data streams such as manual event coding, eye tracking, and even facial expression data provides researchers a better overview and understanding of all that occurs during a research session. Next, facial expression data can also be integrated into The Observer XT. 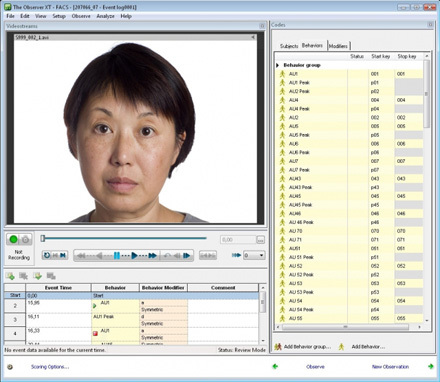 FaceReader is the most robust tool on the market for automatic analysis of facial expressions. It is used in neuroscience research to assess social behavior, and even as a treatment or diagnostic tool for autism patients. FaceReader automatically classifies happy, sad, scared, disgusted, surprised, angry, neutral, and contempt, and also provides gaze direction, head orientation, and personal characteristics such as gender and age. To provide further detail, analysis of 20 commonly used facial action units is available. FaceReader Action Unit Module in action. Diverse scientific articles citing Noldus products are published in renowned journals each week. The following list is only a small selection of scientific publications relevant to the research field of human neuroscience. Abraham, E.; Hendler, T.; Zagoory-Sharon, O.; Feldman, R. (2016). Network integrity of the parental brain in infancy supports the development of children's social competencies. Social Cognitive and Affective Neuroscience, 1707-1718. El Haj, M.; Antoine, P.; Nandrino, J.L. ; (2016). More emotional facial expressions during episodic than during semantic autobiographical retrieval. Cognitive and Affective Behavioral Neuroscience, 16, 374-381. Jackson, P.L. ; Michon, P.; Geslin, E.; Carignan, M.; Beaudoin, D. (2015). EEVEE: the Empathy-Enhancing Virtual Evolving Environment. Frontiers in Human Neuroscience, 9, 112. St. John, A.M.; Kao, K.; Choksi, M.; Liederman, J.; Grieve, P.G. ; Tarullo, A.R. (2016). Variation in infant EEG power across social and nonsocial contexts. Journal of Experimental Child Psychology, 152, 106-122.